Education as an integral part of development of human resources has received an impetus with the establishment of the University of Gorakhpur. Progress in this sphere has been impressive over years. Gorakhpur has residential University, Engineering College, Medical College and Degree colleges for the students of the eastern region of Uttar Pradesh. Setup in 1957, 25 thousand students at present, are enrolled with approximately 320 teachers. 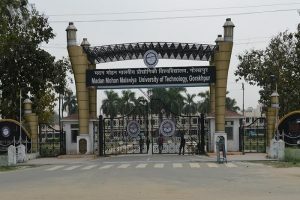 Apart from the general courses, the University offers courses in Bio-Technology, Bio-Chemistry, Computer, Journalism, fine Arts & Music and MBA . It is also the centre of Academic Staff College (under UGC) and Indira Gandhi National Open University( IGNOU). It produced two chief ministers of the State, Shri. Vir Bahadur Singh and Shri. Raj Nath Singh Number of faculty members have held the post of Vice Chancellor, in different Universities with dignity. The prominent Vice Chancellor of Gorakhpur University were Prof. R.P. Rastogi (BHU), Prof. Nagendra (Lucknow), Prof. U.P. Singh (Purvanchal Univ. ), Dr. Vidya Niwas Misra (Kashi Vidya Peeth), Prof. V.S. Pathak, Prof. Radhe Mohan& Mishra, Prof. Revati Raman etc. It also gave Directors of Higher Education Commission, Rajarshi Tondon Open University, Secondary Education Commission. Established in the year 1969, it is 6th Medical College in Uttar Pradesh. It is named after the prominent Social Worker Baba Raghav Das, a devoted freedom fighter and Sarvadaya Leader of this area. The College is situated 8 kms from the Gorakhpur Railway Station. Professor P.L. Shukla, was the founder Principal and Professor of Anatomy. This institution is affiliated ; with Gorakhpur University. The teaching hospital complex ‘Nehru Chikitsalaya’ came into existence in 1974. It has got 650 indoor beds and out patient departments for various disciplines of medical services. Since 1980, the College is running Post Graduate training programme also, for the degree of M.S. & M.D. in Anatomy, Surgery, orthopaedics, Obst.& Gynaecology, Opthalmology, Phisiology, Pharmacology, Pathology, Anaesthesiology, Pediatrics, Medicine, Skin & V.D. etc. In addition to these courses, it also runs diploma courses, of the above listed departments. St. Andrews College, oldest one and founded in 1899 by the Church Missionary Society, grew out of the mission school. Digvijaynath College, set up in 1969, is named after the mahant Digvijaynath of Gorakhnath temple.